Aquatic Life Divers, which specialises in organising educational and recreational dive tours in and around Hawaii, has taken delivery of two new dive support catamarans at its base in Honokohau Harbor. 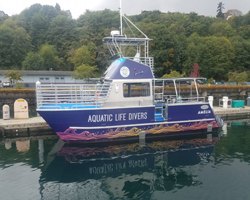 The duo, christened Amelia and Johan, was constructed by Armstrong Marine of Washington State and will primarily be used to offer snorkel and scuba charters. The cats will also be utilised to support the Reef Check Worldwide EcoDiver project, which seeks to stress the importance of conserving the world’s reefs by enabling interested parties to view these natural underwater structures at close range. Each cat measures 9.75m x 3.96m, has the capacity to carry up to 16 passengers and is powered by twin Yanmar outboards, rated 224kW apiece. Built to comply with US Coast Guard (USCG) Subchapter T requirements for small passenger vessels under 100tonnes, the vessels’ notable design features include fly bridge helm stations, dive tank racks, storage tables for camera equipment and dive weights, as well as fresh water showers for the passengers to freshen up, post-dive.